With hot new makeup trends popping up constantly, sharing skincare tips and makeup secrets never gets old. And since K-beauty is one of the big pillars of Hallyu, there’s no shortage of beauty reality shows that uncover the best tricks of the trade. Both for those who have trouble telling the difference between an ampoule and a serum as well as for beauty aficionados eager to up their beauty game, here are some interesting shows to catch up on. Hosted by model Jang Yoon-ju, OnStyle’s “Get It Beauty 2018” is all about promoting healthy beauty tips and habits that upgrade your life. As one of the longest-running beauty reality series in Korea, the show has a fairly big following. One of the highlights of the show is their blind test of cosmetics designed to discover products that give you the best bang for your buck. The show’s panel of judges tests every type of product imaginable, including blushes, concealeres, blackhead removing creams, and many more. Based on their blind test, the judges give out their very own “beauty-life-balance” (뷰라벨) seal of approval to the best products that catch their eye. Various celebrity guests and other beauty experts are invited to each episode to share their own unique skincare tips and beauty hacks. In one episode, EXID’s Jung-hwa shared that she likes to apply eyeshadow primer to her lips as a way to make her lipstick last all day. The show also invites male beauty influencers to get their take, and they discuss a wide array of products geared towards both women and men. 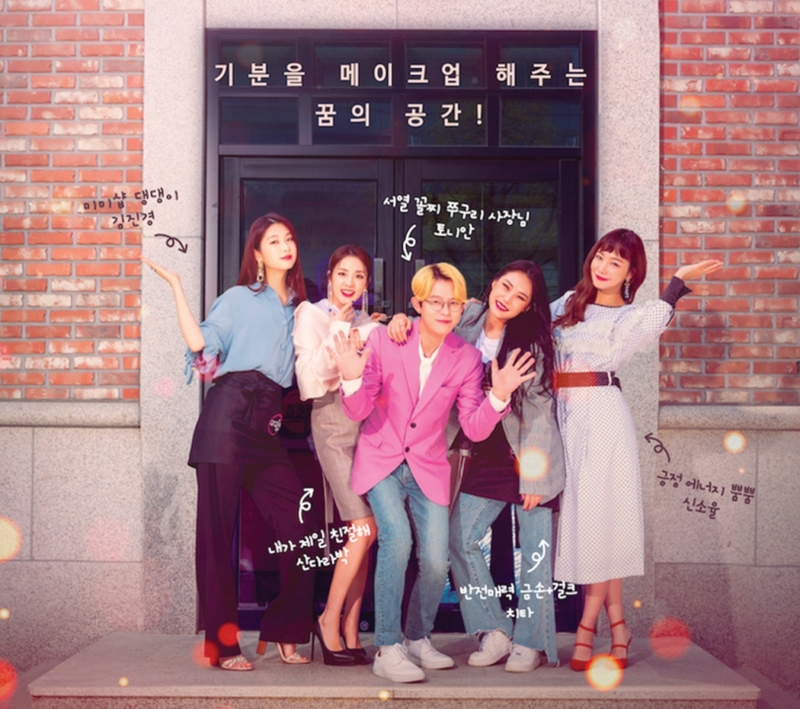 JTBC4 has launched an interesting new beauty reality show called “Mimi Shop.” Starring celebrities like Tony Ahn, Sandara Park, and Cheetah as Mimi Shop “employees,” the show follows them around as they learn new makeup techniques and try them out on various guests that visit the shop. From timeless looks that never go out of style to avant garde makeup tricks that give you that oomph you need, Mimi Shop staff learn it all. Unlike “Get It Beauty,” which focuses on sharing beauty tips, “Mimi Shop” is more of a talk show that offers makeup sessions as a way to cheer people up and bring therapeutic healing. Mimi Shop employees and visitors don’t just share their makeup tips but also talk about their personal stories of hope and hardship. DongaTV’s “Beauty Girl” (뷰티엔부티) is back for season two and has a new panel of “beauty masters,” including Jeong Ga-eun, Hwang-bo, Sleepy and Maeng Seung-ji. The show features a wide variety of practical beauty tips on how to take your makeup and skincare routine up a notch. For the most part, the show is a roundtable of celebrities and beauty experts reviewing the latest cosmetics and skincare tools and devices. While there are plenty of beauty variety shows that are both entertaining and informative, Korean networks have yet to launch any beauty competition series like those currently popular abroad, such as Lifetime’s “Glam Masters” and “American Beauty Star.” It’ll be interesting to see how Korean networks put their own spin on future beauty programs.